What a beautiful piece of jewelry! 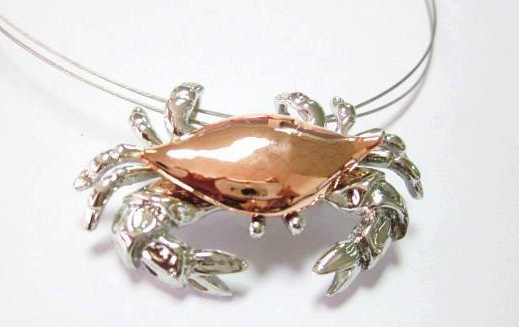 This surgical steel crab has a copper plating over the shell area. The copper is polished to a bright luster. You have the choice of keeping it polished bright or allowing the copper to slowly change color to a multi-hued look. We have many customers who like the color changed look with it's greens, blues, browns and other colors. The beautiful necklace doubles as a brooch! Just slide the neck wire out through the back fins and with its pin back you have an exquisite brooch. 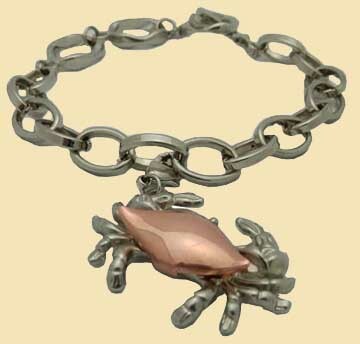 This beautiful crab toggle bracelet features a surgical steel crab that has copper plating over the shell area. The copper is polished to a bright luster. The bracelet length is adjustable to fit most wrists. A ship's anchor hooks through the chain for closure. 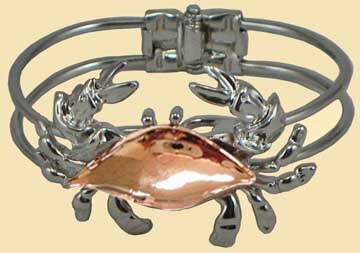 A gorgeous looking crab cuff bracelet with a surgical steel crab that has copper plating over the shell area. The copper is polished to a bright luster. The bracelet is spring hinged in the back and opens up behind the crab. A really stylish looking bracelet! Crab Approx. 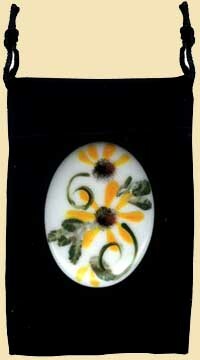 3/4" x 1/2" - length approx. 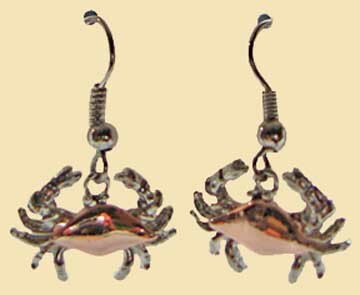 1 1/8"
These fashionable crab dangle earrings feature a surgical steel crab with a copper plated shell. The copper is polished to a bright luster. French wire back with clutch earring backs. They look great! Crab Approx. 3/4" x 1/2"
These lovely crab post earrings feature a surgical steel crab with a copper plated shell. The copper is polished to a bright luster. Post with clutch earring backs. They look great! 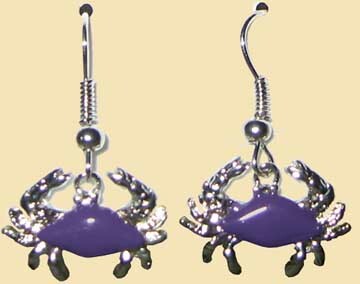 These fashionable crab dangle earrings feature a surgical steel crab with a purple enameled shell. French wire back with clutch earring backs. Great for Raven's game days! These lovely crab post earrings feature a surgical steel crab with a purple enameled shell. Post with clutch earring backs. Great for Raven's game days! These lovely crab post earrings feature a surgical steel crab with a red enameled shell. Post with clutch earring backs. They look great! 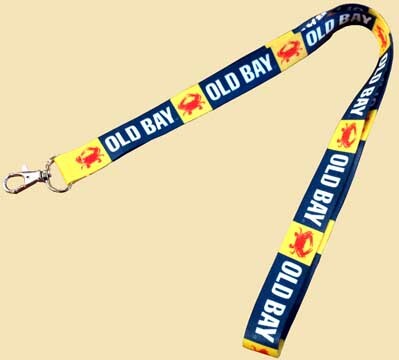 This fabric lanyard features the blue Old Bay banner with yellow squares in between the banners. The yellow squares have a red crab in the center. Clip end for key ring. Plastic - Key fob approx. 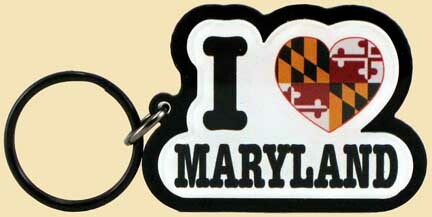 2 1/4" x 1 5/8"
This key ring has the "I love Maryland" sentiment with the word love represented by a Maryland Flag design heart. Made of plastic/acrylic with the white cutout design stacked on the black background. Vinyl - Approx. 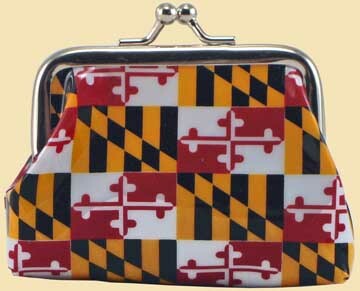 3 1/2" x 2 1/2"
This vinyl change or coin purse has the Maryland Flag design. Metal snap closure. 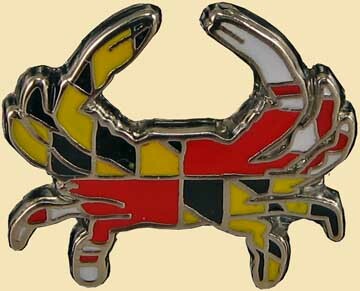 This Maryland flag crab design tack pin is perfect for lapels, coats, blouses, or for use as a tie tack. 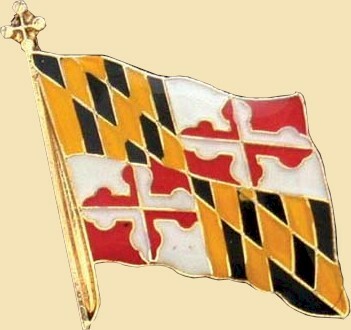 This Maryland Flag tack pin is great for a lapel, blouse, or for use as a tie tack. This tack pin has a gold colored blue crab figure over the word "Maryland". Metal backing. Plastic with metal ring - Key Fob approx. 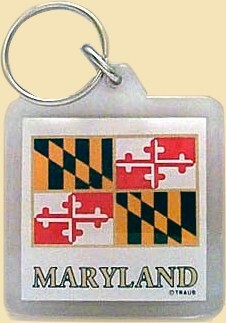 2" x 1 1/2"
This key ring has a collage of Maryland symbols inside the letters "MD" . Featured in the collage is a Chesapeake Bay scene that includes the Maryland flag, Baltimore Oriole, lighthouse, blue crab, Black-eyed Susans, skipjack boat, crab/oyster boat, seagull, and a sandy beach. 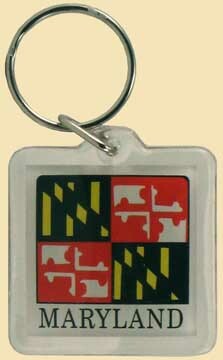 This economical key ring features the Maryland State Flag encased in plastic. 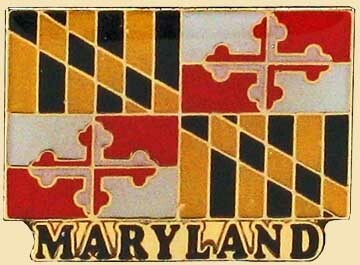 "Maryland" is written below the flag. 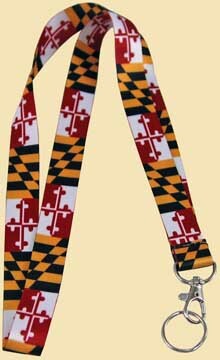 This soft, satiny fabric lanyard has a Maryland Flag design. Clip end for unhooking key ring. 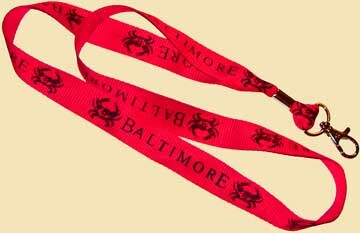 This lanyard has the word "Baltimore" that is bookended by two crabs. Red lanyard with black design. Snap hook end for a keys or ID. Here's a handy way to keep track of your keys. Just attach your keys to the ring and wear the lanyard around your neck. Embroidered cloth lanyard has crab figures with "Maryland" written between. Available in red, blue or black**. **Please note - color of lanyard is usually our choice, but if you would like to request a particular color please enter the request in the "Instructions" section upon checkout. Although we will do our best to honor your request we cannot guarantee choice of color. Approx. 1 5/8" x 1 3/16"
This hand painted oval shaped porcelain pin/brooch features a lovely collection of Maryland's state flower, the Black-Eyed Susan. Packaged in a black velvet pouch. Can be worn north to south or east to west direction. Painted and signed by Carroll County, Md. artist, Bonnie. This detailed blue crab pin has been polished to a fine silver-like finish. This makes a wonderful inexpensive gift for yourself, your family, or your crab loving friends. Made by Salisbury Pewter. 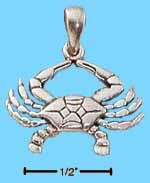 Crab lovers will be delighted with this unique pewter crab claw on a key ring. The claw has been polished to a bright finish for a stylish look. One of our most popular pieces! Made by Salisbury Pewter. 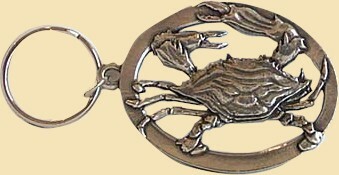 This pewter key ring features Maryland's favorite crustacean, the blue crab, framed by an oval. Made by Salisbury Pewter.